Craig Barrett was Associate Professor of Materials Science at Stanford University. He was CEO of Intel Corporation from 1998-2005, and Chairman until May 2009. Dr Barrett is one of the leading commentators on the importance of education in society and for sustained economic success. Dr Barrett previously served as Chairman of the United Nations Global Alliance for Information and Communication Technologies and Development. He was part of the Government’s Farmleigh Initiative and is Honorary Chairman of the Irish Technology Leadership Group. Formerly Professor and Chair of Organic Materials Physics in the Tokyo Institute of Technology, Professor Fukuda, with more than 300 research papers to his name, is one of the most distinguished leaders internationally in the field of Organic Materials, in particular, ferroelectric and antiferroelectric liquid crystals. He has won a number of professional awards and from 1996 to 2000 he was President of the prestigious International Liquid Crystal Society. His fundamental discoveries have had an enormous impact on the new generation of displays and in electro-optic and spatial light modulators in information and communication engineering. Professor Fukuda was an SFI Walton Professor from 2002-04 and since 2004, as a Trinity Visiting Professor, he has published 30 papers in high impact research Journals jointly with researchers in Trinity. Amos Oz, Professor of Hebrew Literature at the Ben Gurion University of the Negev in Beer Sheva, is the author of 35 books, four collections of stories and novellas, children's books, and nine books of articles and essays. Since the 1967 war Amos Oz has published numerous articles and essays about the Israeli/Arab conflict, campaigning for an Israeli/Palestinian compromise. As one of the leading figures in the Israeli Peace movement since 1967, his articles, essays and political activities have made him a foremost figure in Israel and around the world. The recipient of numerous awards for both his literature and for his peace activism, his autobiographical novel "A Tale of Love and Darkness" is an international bestseller and has been honoured with 10 prizes around the world. Mary Redmond is one of the leading lawyers in Irish Employment Law. Her publication on employment law was the bible for fellow lawyers and practitioners for many years. She subsequently became known for her social entrepreneurship. In 1985 she set up The Irish Hospice Foundation which established the modern hospice movement in Ireland and is now the leader of the voluntary sector in hospice. In 1999 she established The Wheel, a support and representative body connecting community and voluntary organisations and charities across Ireland which has evolved to become a resource centre and forum for the community and voluntary sector. Lelia Doolan is a notable producer and theatre director as well as film maker, journalist, writer, teacher, community activist and commentator on social justice. She has demonstrated a life-long commitment to the arts and entertainment in all its forms. She began acting and presenting in the newly established RTE in 1961, moving soon to producer/director. She was responsible for the establishment of The Riordans. Dr Doolan was artistic director of the Abbey Theatre for two years before completing a PhD in anthropology at Queen’s University where she also worked in community video and adult education in Belfast. Between 1979 and 1988 she taught at the College of Commerce, Rathmines. She was chairperson of the Irish Film Board between 1993 and 1996, was a founder and director of the Galway Film Fleadh, and is currently Chairperson of Solas Galway’s Picture Palace Teoranta. Dr Doolan recently directed a documentary about Bernadette McAliskey. 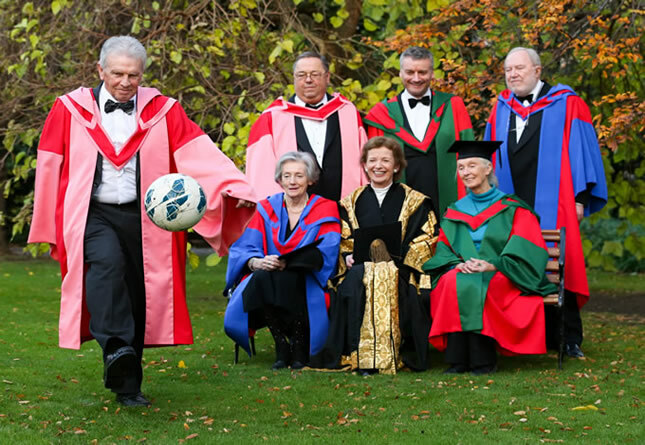 A distinguished sportsman and commentator, Johnny Giles is one of Ireland’s best known and most popular sports figures. He is a former professional footballer playing first for Manchester United and then for the very successful Leeds United side in the 1960s and 70s. He also played 59 times for Ireland, and is widely regarded as one of the best ever Irish footballers. Since retiring from professional soccer, Giles managed several teams, including the Republic of Ireland, and subsequently served as an analyst and commentator for RTE and other media, contributing enormously to public understanding of the sport.>Born in inner city Dublin, he remains close to his roots. He has made very significant and sustained endeavours to help children from disadvantaged backgrounds develop their sporting and life skills, culminating in the establishment in 2011 of the John Giles Foundation which aims to promote soccer as a positive influence in the lives of disadvantaged young people. Jane Goodall, PhD, DBE, is an ethologist. Considered to be the world's foremost expert on chimpanzees, Goodall is best known for her 54-year study of social and family interactions of wild chimpanzees in Gombe Stream National Park, Tanzania. Her ground-breaking research redefined our understanding of the great apes and made her ‘the woman who redefined man’. A tireless campaigner for conservation, animal welfare issues and environmental consciousness, she is the founder of the Jane Goodall Institute working in nearly 30 countries and of Jane Goodall's Roots & Shoots, a humanitarian, conservation and education programme for young people, active in more than 130 countries. She was made a UN Messenger of Peace by Kofi Annan in 2002 and reappointed by Secretary General Ban ki Moon. 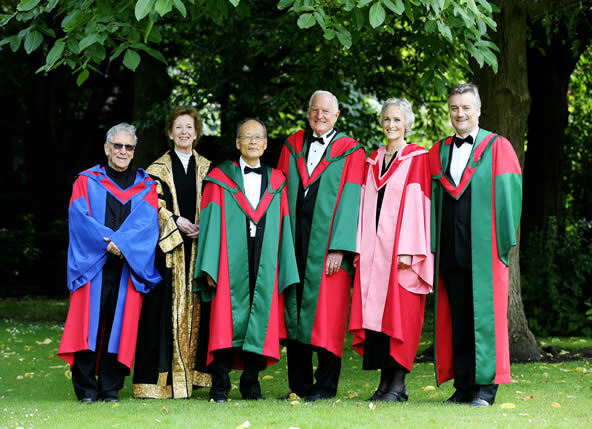 Emeritus Professor at Queen Margaret University, Edinburgh, and previously Vice-Principal for Research, University of Edinburgh, John Laver is one of the outstanding phoneticians of his day, holding many distinctions and awards for his scholarship. His book, Principles of Phonetics is an essential reference work for phoneticians and for all who work in the area of speech communication. His research on voice quality has intersected with and had a major impact on the research of Trinity’s Phonetics and Speech Laboratory. John Laver has also been a tireless and eloquent advocate for the arts and humanities across all disciplines and was instrumental in making the case for increased research funding for the humanities in the UK. Professor Laver has made a significant contribution to Trinity, initially as chair of the 2006 external review of arts and humanities research in Trinity which led to the creation of the Trinity Long Room Hub, and subsequently as inaugural Chair of its Board. David Went holds a BA Mod. in Legal Science from Trinity and graduated as the Sir John Brooke scholar of his year from Kings Inns as a Barrister at Law. He is one of the foremost voluntary contributors to the College in recent decades and gave freely of his time and expertise over 11 years as Chairman of the Trinity Foundation during which time the Foundation, through its board and staff, was tremendously successful. He has also been personally involved in supporting the Trinity Access Programme (TAP) and the National Institute for Intellectual Disability (NIID). He has had a distinguished career in banking and insurance, serving in many senior positions in Ireland and abroad as: Chief Executive of Ulster Investment Bank, Chief Executive of Ulster Bank Group, Chief Executive of Coutts Group and Group Chief Executive of Irish Life & Permanent plc (1998-2007). In 2009 he was appointed by the Minister for Finance as Chairman of the Consultative Industry Panel to the Financial Regulator. He has been Chairman of the Board of The Irish Times Limited since 2007. The seminar was followed by a reception hosted by Dublin University AFC.